Personalised gifts are always so much more meaningful than ones that aren’t and if you know a man that loves to hold a BBQ then this may be the perfect personalised gift for him. This chef’s hat would make a fantastic gift for any BBQ King and can be personalised with a name of up to 20 characters. 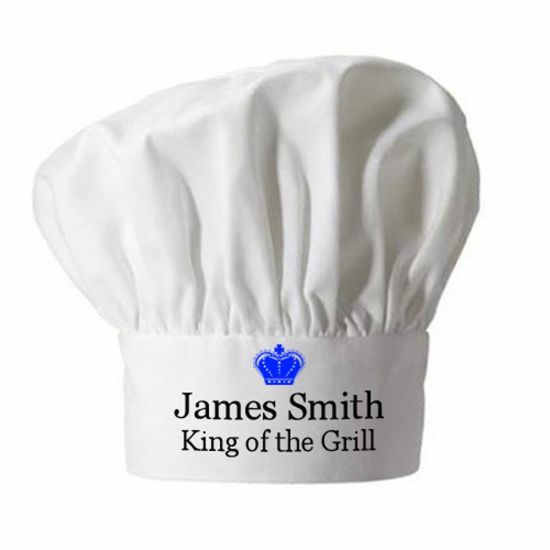 The blue crown and tagline ‘King of the Grill’ come as standard. This hat is 100% polyester so it can be put in the wash and still retain its shape and colour. One size fits all. This would make a great gift for a birthday or Christmas or could just be a fun gift to buy for a friend that grills no matter what the weather.